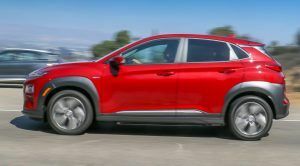 Hyundai's excellent Kona subcompact crossover gets a powerful motor and big battery. Among sub-$50,000 EVs, the only one that tops the Kona EV's range is the base Tesla Model S. Know anybody who actually took delivery of this base Tesla? Us neither.